t*rexes and tiaras: friday favourites 064.. I guess it's because I've had such a work-stressy week, but I went into a couple of shops the other day and was only interested in the work clothes. I'm not usually one for separate work and play sections of my wardrobe, but the last few days have found me thinking of maybe changing this, and updating the more"meeting-friendly" rail in my wardrobe room. There are a couple which are topping the list at the moment. 001: I guess the sequins on this dress make it a little dressy for work in most people's books? I think that's what drew me to it on the Serene Order site. I don't think it would look too formal with a blazer and a pair of heels. And the fact that it's reduced to just £25 in the sale has me even more tempted. 002: This one I find a little more tricky to explain why I was drawn to. It's really not my usual shape. I've never really embraced the colour blocking trend. But, it's good to get out of your comfort zone every now and again, isn't it? That's what I was trying to tell myself on my way to Metafit class this morning, anyway. I can't decide which one to go for - help please?! 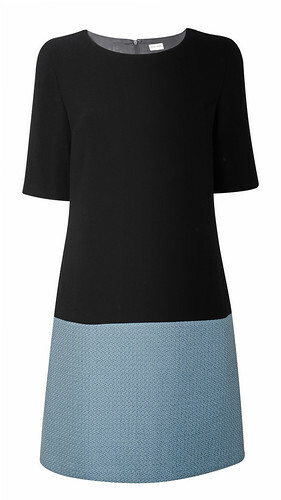 I love the colour blocked dress, I think it would look lovely on you! That blue is super pretty, I would totally purchase but I don't think it would suit me at all! That sequinned dress is fantastic. Very smart. 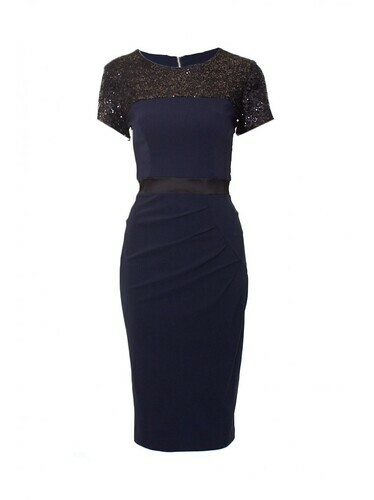 Love navy & black together, really ought to inject some into my life.